Did you know that in 2018 only 12 percent of senior leaders in American museums were people of color? 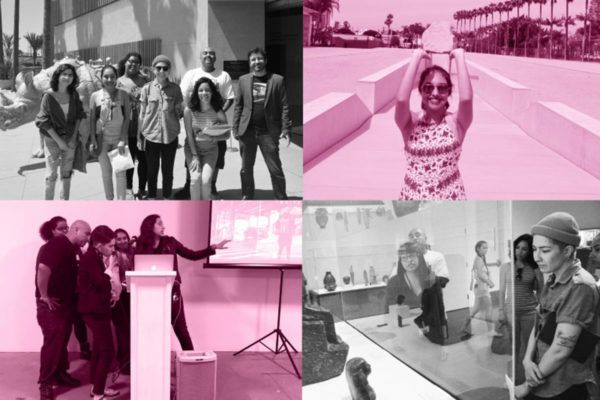 Museum of Contemporary Art Santa Barbara (MCASB) is taking steps to change that! Join Abaseh Mirvali, Executive Director, Chief Curator & CEO of MCASB, Sarah Dildine, ELA Program Manager, and presenters from MCASB’s Emerging Leaders in the Arts, along with other members of the cultural community, to learn more about the role of diversity and equity in the arts, as well as ways you can participate in changing the landscape. A 2015 study conducted by the Mellon Foundation to assess diversity in museums, museum leadership, and with specific job categories at museums, found that a great majority of specialized roles (specifically curatorial and leadership roles) in the 332 museums surveyed were held by White (Non-Hispanic) individuals. In the second iteration of the study in 2018, the Foundation found that while the percentage of people of color hired by the same institutions rose 9 percent (from 26 to 35 percent), the percentage of people of color in leadership roles only rose 1 percent (from 11 to 12 percent). As one of only twenty programs funded by the Walton Family Foundation and Ford Foundation Diversifying Art Museum Leadership Initiative (DAMLI), Emerging Leaders in the Arts has set the tone for addressing this issue. At MCASB, we believe that the arts and arts education play an essential role in impacting the human experience and that individuals within the arts and museums must reflect our entire lived experience, representing all cultures and experiences. Emerging Leaders in the Arts (ELA), a program conceived of and facilitated by Museum of Contemporary Art Santa Barbara and funded by the Walton Family Foundation and the Ford Foundation, demonstrates to young individuals who identify as people of color that pursuing and securing curatorial and museum leadership roles is not only possible but achievable and necessary in order to preserve and elevate the cultural perspectives of our rapidly-changing diverse local community and beyond. For more information, please click here. Tonight's panel will include Kevin Claiborne and Christopher Anthony Velasco. Kevin Claiborne (b. 1989, Washington, D.C.) is a multidisciplinary conceptual artist currently working in Santa Barbara whose work examines and questions intersections of identity, social justice, and mental health, particularly within the Black American experience. Christopher Anthony Velasco is a MFA candidate in the Fine Arts Department at UC Santa Barbara. He received his BFA from California Institute of the Arts and also studied at Art Center College of Design and East Los Angeles College. Velasco is a former Getty Marrow Undergraduate Intern. He is mixed-media artist who utilizes self-portraiture, performance, and the documentation of the urban landscape, the obscure and gay identity. Velasco’s work has been featured in exhibitions at Art Center College of Design, Avenue 50 Studios, California Institute of the Arts, Hibbleton Gallery, Los Angeles Center for Digital Art, Photo-L.A., and Vincent Price Art Museum. In addition, he was included in Where We Live: Student Perspectives, an exhibition associated with the Getty Museum’s Where We Live: Photographs of America from the Berman Collection.